To create a data set using a Microsoft Excel file data source, upload an .xlsx file from a local or networked drive. The data will be imported into SPICE. For more information about creating new Amazon S3 data sets using Amazon S3 data sources, see Creating a Data Set Using an Existing Amazon S3 Data Source or Creating a Data Set Using Amazon S3 Files. Use the following procedure to create a data set based on an Excel file. Check Data Source Limits to make sure that your target file doesn't exceed data source limits. In the FROM NEW DATA SOURCES section of the Create a Data Set page, choose Upload a file. In the Open dialog box, choose a file, and then choose Open. 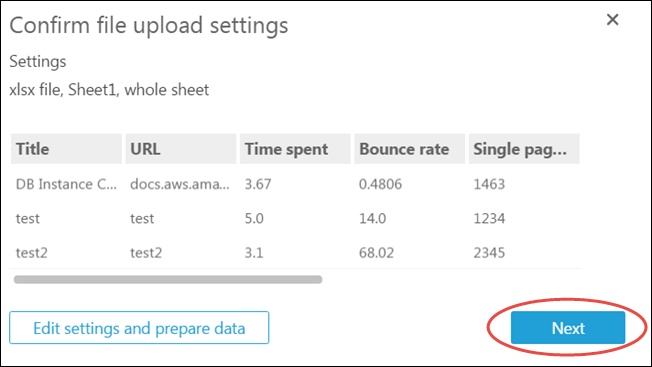 A file must be 1 GB or less to be uploaded to Amazon QuickSight. 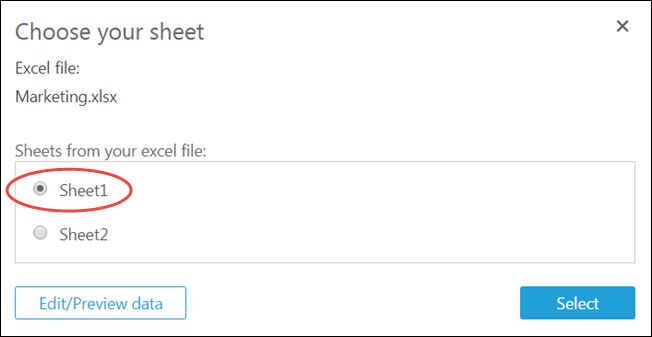 If the Excel file contains multiple sheets, choose the sheet to import. You can change this later by preparing the data. On the following screens, you have multiple chances to prepare the data. Each of these takes you to the Prepare Data screen. This screen is the same one where you can access after the data import is complete. It allows you to change the upload settings even after the upload is complete. Choose Select to confirm your settings. Or, you can choose Edit/Preview data to prepare the data immediately. A preview of the data appears on the next screen. You can't make changes directly to the data preview. If the data headings and content don't look correct, you can choose Edit settings and prepare data to correct the file upload settings. On the Data Source Details screen, you can choose Edit/Preview data. You can specify a data set name in the Prepare Data screen. If you don't need to prepare the data, you can choose to create an analysis using the data as-is. Choose Visualize. Doing this names the data set the same as the source file, and takes you to the Analysis screen. To learn more about data preparation and excel upload settings, see Preparing Data.